Ken Roczen won the battle, but Ryan Dungey won the war. The race was never in doubt, Roczen would led wire to wire in a relatively easy win, if there is such a thing. But he had to watch Dungey celebrate another title—Dungey’s third in 450SX—after Dungey finished fourth to clinch the 2016 Monster Energy Supercross Championship. Roczen opened a nearly four second gap over Cole Seely early in the race, a lead he would stretch to nearly 20 by race end. 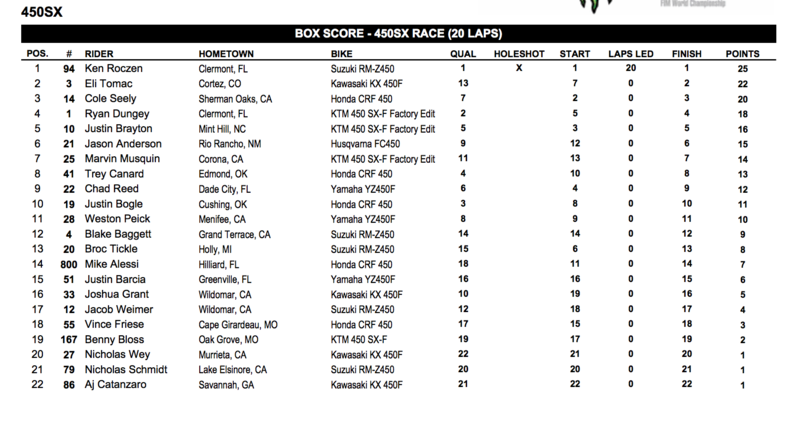 It was a second straight nearly flawless performance from Roczen, who won last weekend as well. Roczen now has five wins on the season, but it won’t matter if he wins next weekend, as Dungey holds a 36-point lead with only 25 points remaining. It was a bittersweet night for Dungey, who’s all-time podium streak ended at 31 with a fourth. Dungey worked to third and was pressuring Cole Seely for second, but neither could stop the hard charging Eli Tomac, who passed Dungey on lap 15 in the whoops, and then Seely the very next lap. Dungey continued to pressure Seely, trying to pass him in the first rhythm section, but could never get enough momentum to make it stick. Justin Brayton nearly got Dungey at the finish but had to settle for fifth. 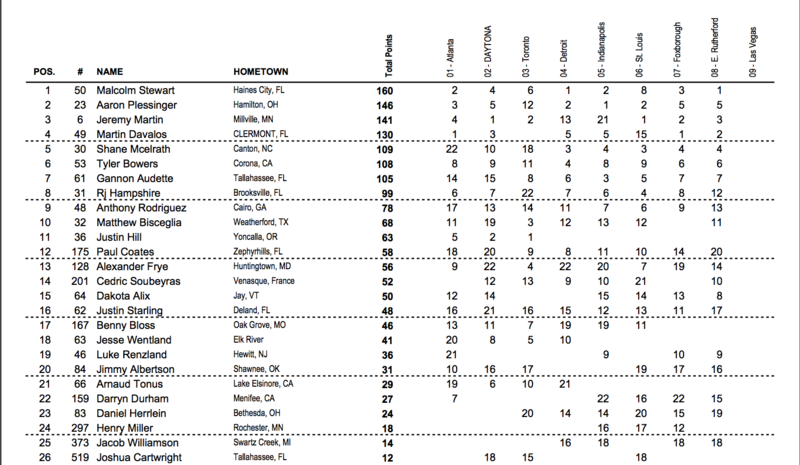 Jason Anderson, Marvin Musquin, Trey Canard, Chad Reed and Justin Bogle would round out the top ten. Malcolm Stewart took another step toward his first career 250 supercross championship tonight at MetLife Stadium in East Rutherford, New Jersey. A flawless 15 laps from the points leader puts Malcolm in the drivers seat heading into the Monster Energy Supercross season finale next week in Las Vegas. It was last week’s winner Martin Davalos with the early lead over Dakota Alix, Tyler Bowers and Stewart. Malcolm would strike early, blitzing past Bowers in the whoops. The very next lap, Stewart used the same line to pass Davalos for the lead. Davalos keep him honest, but Stewart held up under pressure to claim his second win on the season. Entering the weekend five points back, Aaron Plessinger salvaged what he could on the night with a fifth. After entering the first lap in fifteenth, Plessinger fought back, but lost valuable points to Stewart and will head to Vegas next weekend fourteen down. Jeremy Martin moved into third early in the race but never put any heat on Davalos for second. While still mathematically alive—at nineteen points down—Martin’s title chances are all but over. Shane McElrath rode to a solid fourth. 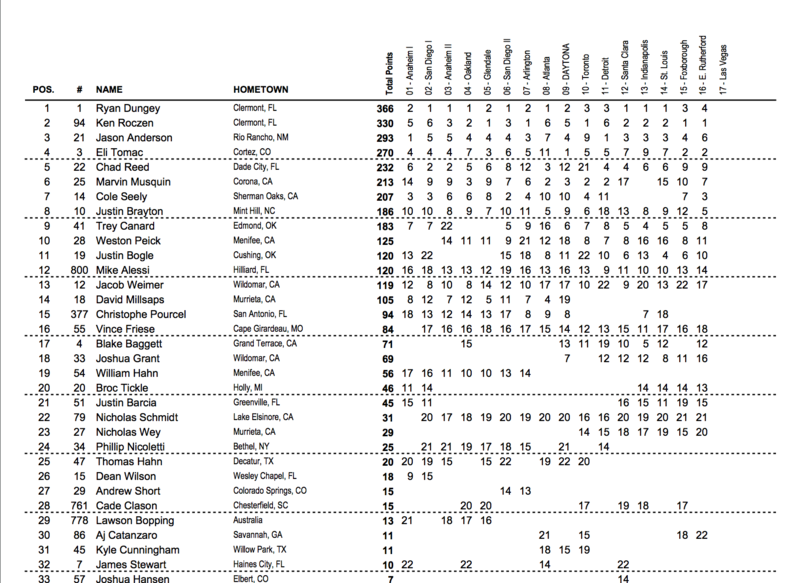 Plessinger, Bowers, Gannon Audette, Alix, Luke Renzland and Cedric Soubeyras would round out the top ten.